There are many things a stay-at-home dad can teach his toddler, but sometimes it is better for the child to learn through peer pressure. For instance, children are not born with the ability to play well with others and need exposure to other toddlers to learn this key skill. 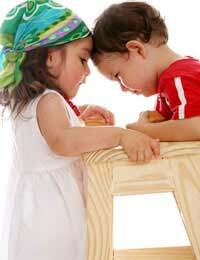 Toddlers are fascinated by other children and, although too many new faces at one time may make them a bit nervous, they will enjoy the company of other toddlers. This interaction is a crucial part of a child’s development and is one of the reasons why it is crucial for a househusband to take the plunge and go along to his local parent and toddler group. Toddlers are never short of something new to learn. For a start, there is learning to stand, walk, run, handle and manipulate blocks and boxes, turn knobs and throw balls. Learning social skills, such as sharing, is not high on the list of priorities for a toddler. At this age, children are only beginning to learn what it is like to own things, and this pride of ownership can lead to seemingly selfish behaviour. All of a sudden, ‘mine’ can become a toddler’s favourite word, while hoarding toys and books is not uncommon. Peer pressure can teach children how to share and develop their skills in conflict resolution. It is unrealistic to expect a toddler to start giving, as the concept is an alien one, but playing in a group can prepare toddlers for sharing in the future. Children learn to be generous when mature enough to take the perspective of another person and to not feel deprived. A lot of children do not share because they fear giving up something they enjoy. By reinforcing that they will not become empty-handed if they share their toys, the process becomes easier for them to embrace. How to function in a group other than family. The concept of sharing and taking turns. How to recognise different feelings. Appropriate ways to express those feelings. To have a positive and a caring attitude towards others. How to behave in a safe manner. To use toys to interact and communicate with others. To recognise people they come in regular contact with. How to cope with, communicate and managing their feelings. That actions have implications for others. How to communicate needs and desires. That games are more enjoyable if played with someone else. Regular exposure to such an environment will also make it easier when the time comes for the child to be left at nursery school. By learning to play with others and not rely as heavily on parents, the child will not find it as tough to say goodbye to dad and is more likely to trust and understand that dad will return later when it is time to go home.